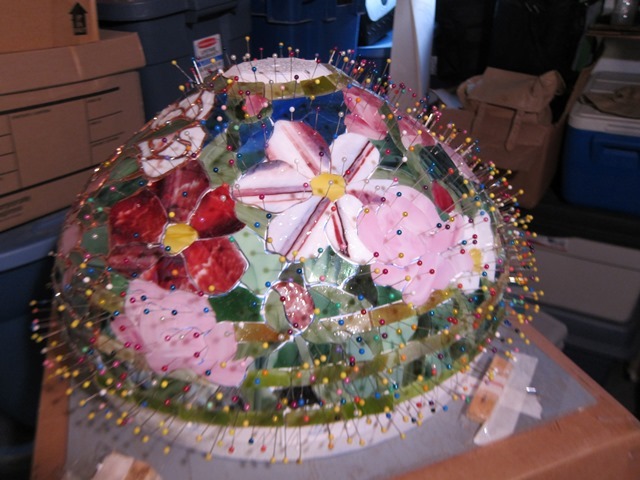 I worked most of the morning on finishing the grinding for the last 2 panels of the Peony Lamp. All done and now ready for foiling. I finished just before Maneau and Jake arrived for a visit to celebrate Jake’s birthday. We enjoyed a lovely afternoon on the deck with a pitchure of Sangria and nibblies. Then off to Taste of Egypt for dinner. Great food. Lots of fun and laughs. We told Jake not to tease the Moose. After we came home to watch the Black Hawks trounce the Bruins! Since I was the only Black Hawks fan in the room, I had to Hi-5 myself.